Xoxomilco, whose name means “garden of flowers” in the ancient Aztec language, is Cancun’s homage to the floating gardens and canals of Mexico City’s famous Xochimilco neighborhood. Here, visitors can experience a number of Central American traditions, including floating boats strung with flowers, live music, and regional food. Most Xoximilco tours leave from central Cancun and include pickup and drop-off from local hotels. At the park, you can float down the river in a Mexican gondola, or trajinera, enjoy a meal of traditional Mexican food, sip tequila and beer, and listen to traditional mariachi and marimba music. 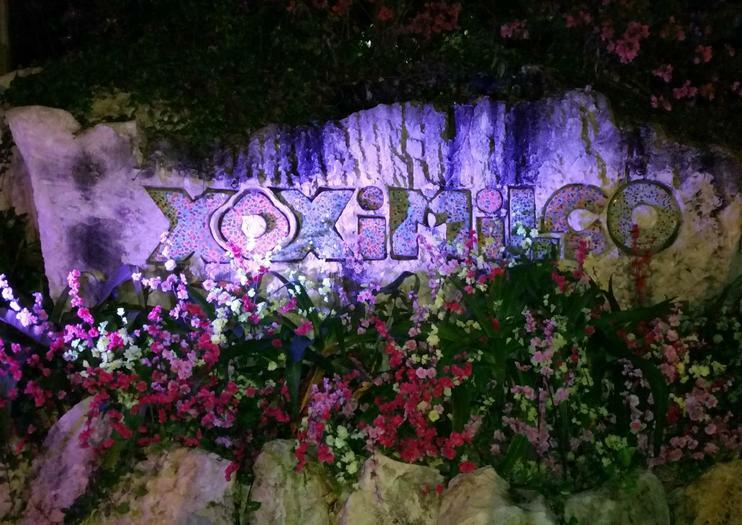 Xoximilco Cancun is part of a network of related parks and experiences, including Xcaret, Xel-Hal, Xplor Fuego, Xplor, Xenotes Oasis Maya, Xoximilco Cancun, Xichen, and Xenses. You can purchase packages granting admission to multiple parks. Xoximilco Cancun is a must-see attraction for culture and nightlife lovers. The park is located in the jungle, so be sure to plan for mosquitos; wear long pants and closed-toed shoes, and bring plenty of biodegradable insect repellent. Valet parking is available onsite. Wheelchair service is available; all boats are wheelchair accessible. Xoximilco is located about five minutes by road from Cancun International Airport. While most tours provide round-trip transportation from your hotel, you can also take a taxi or drive yourself. The park is busiest from December through April, when the weather tends to be sunny and warm; there are fewer crowds during hurricane season (May through October). Nights at Xoximilco are particularly magical. The floating gardens of Xochimilco are a Mexico City must-see; the quintessential way to explore is a traditional trajinera boat ride around the canals and islands. Combine it with a Mexico City sightseeing tour, which will include the National University of Mexico, the ancient ruins of Teotihuacan, and the the neighborhood of Coyoacán, home to the Diego Rivera Anahuacalli Museum and the Frida Kahlo Museum. Cruise through Xoximilco, modeled after an ancient Aztec city, on this 5-hour evening on a flat-bottomed boat. Xoximilco is a modern replica of a UNESCO World Heritage Site, criss-crossed with canals that bear these traditional boats called trajineras. Enjoy a tasting menu of authentic Mexican food, including tequila and beer. Listen to traditional Mexican mariachi and marimba music while you enjoy personalized attention from your guide during this small-group tour, limited to just 20 people. Board a brightly painted barge called a 'trajinera' for a 3-hour night cruise at Xoximilco Cancun. Set off through a canal made to resemble the ancient waterways of UNESCO-listed Xoximilco. Revel in the Mexican fiesta on board as you sample snacks, drink tequila and beer, and listen to live mariachi music amid the shimmering lights. Round-trip hotel transport is included. Floating along the canals of Cancun in a ‘tranjinera’ (gondola) is a Mexican experience that cannot be missed. This 3-hour tour of Xoximilco, on a traditional tranjinera, ensures an unforgettable experience of a Yucatan fiesta. Feast on a 3-course Mexican meal; sip unlimited tequila, beer, and soft drinks from an onboard bar; and listen to live music performed by mariachi and bolero bands. Each boat has a maximum capacity of 20 passengers. Enjoy a lively evening cruising the canals of Xoximilco aboard brightly painted trajinera boat. Set out for a fiesta-style cultural tour of Xoximilco, which comes alive with the music of live mariachi bands as you float past scenery illuminated in lights. Sing, dance and play traditional Mexican games as you go; then sit down to a wonderful feast of authentic Mexican fare. Dance and Navigate in a wonderful set of channels on Board of bright and colorful trajineras; book the most special night with your family and friends and celebrate it in Xoximilco. surrounded by nature and folklore scenarios incomparable place where one lives unique Cancun Mexican tradition. A surrounded by nature and folklore scenarios incomparable place where one lives unique Cancun Mexican tradition. Navigate in a wonderful set of channels on Board of bright and colorful trajineras; book the most special night with your family and friends and celebrate it in Xoximilco. Live the joy of the Mexican culture, customs and traditions through music, dance, games and food in an excursion on board colorful Mexican Gondolas across unique scenery from Mexico. An incomparable place surrounded by nature and folklore scenarios where a unique Cancun Mexican tradition, live sailing in a wonderful set of channels on Board of bright and colorful trajineras, lives the most special night with your family and friends.